Want to build a TARDIS? Traversable Acausal Retrograde Domain in Space-time. So what do you think script editor and computer guru Christopher H Bidmead would have made of this? A mathematics and physics instructor at the University of British Columbia Benjamin K Tippett and his colleague David Tsang have formulated a mathematical model that arguably offers a viable time machine. 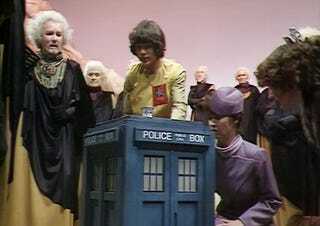 Hopefully without the gravity and dimension crunching effects that afflict the Doctor in Logopolis? Their model is revealed in a paper called A Traversable Acausal Retrograde Domain in Space-time. Those initials seem familiar. The paper is published on IOP Science Journal along with others that might be useful if interstellar travel is an ambition. Tippett and Tsang describe their model as a bubble of space-time geometry which carries its contents backward and forwards through space and time over a large circular path. The bubble moves at speeds greater than the speed of light allowing it to move backward in time.